The Korean electronics giant will show off its newest devices during an event in Barcelona, Spain. @xiria7: Actually, we're equal opportunity when it comes to the big companies. We also live-blogged and streamed the HTC event earlier too. A little while ago, HTC unveiled its new One (M9), which is gorgeous and also looks just like last year's model. The iPhone 6 and 6 Plus are also metal and known for its more minimalist design. 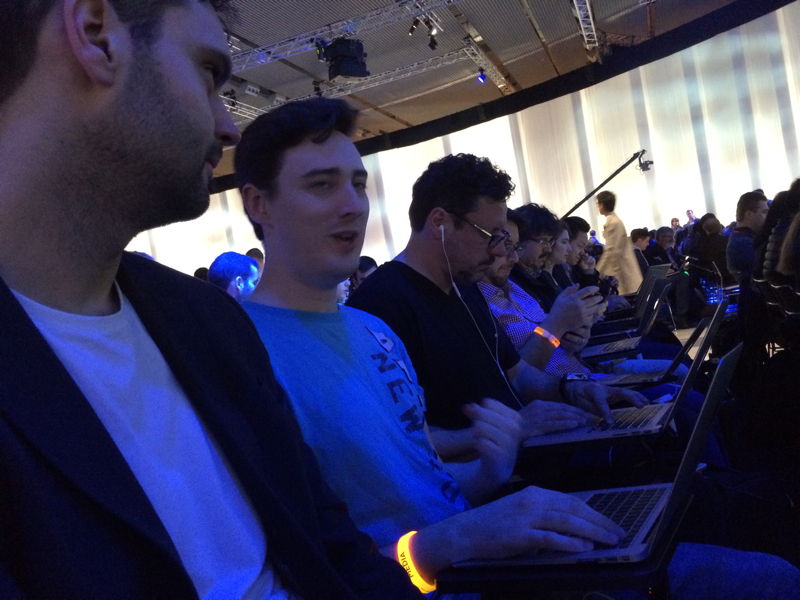 Xiria7, I've been live-blogging Samsung at (or just after) MWC for three years! But glad you're joining us now. Beyond the plastic body, another key criticism has been the amount of preloaded Samsung software put on its smartphones. Let's hope that "bloatware" goes away with GS6. I hope they find some more uses for the edges, as I haven't seen that many developers taking advantage of the Note Edge. @Chris: I hope so too. It'll be a shame if it ends up a gimmick. While Samsung has been pretty fixated on Apple at the high end, it is feeling the heat at the low end with low-cost vendors like Xiaomi taking its share in China and Micromax in India. While we talk about the Galaxy S line a lot, Samsung sees a lot of its volume from the low and mid-tier markets, where phones can be under $200 (without a contract). Do you think this will hold the title as "The next best thing"
@Joe: I'm sure Samsung's marketing will claim it either way. Yeah Roger you are right, but rumor says that they will get rid of the bloatware and there will be just a couple preloaded apps. The edge on the Note Edge is a standalone UI that's always-on and lets you navigate. You also get notifications along that strip. @jessica you've been reporting on Samsung for a few years now. Do you see the addition of the "edge" feature to the Galaxy line as a benefit? I think Xiaomi ate even Micromax share in India too.. Seeing their sales in India, I can say they ate a big chunk of Micromax too! @ashikch: The point is it's crazy competitive, and Samsung is losing its lunch in those markets. AustinOFLA: I guess it depends how this feature develops. On the Note Edge, I kind of liked the idea of it, but rarely used it. Sometimes it slowed me down. I love night mode, though, and I liked getting notifications on the side bar. Ashikch: Micromax ate Samsung's lunch in India as well. Xiamo's flash sales have made inroads, but Xiami hasn't been there long. They'll have a hard time (Xiaomi) getting enough product to actually dominate the market. They're growing, and Samsung should be worried. The mobile industry seems vast, but is pretty small. Xiaomi folks come from big Silicon Valley tech, like Microsoft and Google. Okay, we're about five minutes away from the event. There's a slowly rising level of chatter and buzz in the crowd. But that just may be because there are so many people here. Fingers crossed, by the way, that our Ethernet and Wi-Fi holds up. This space is PACKED. So Samsung has traditionally been a major presence at Mobile World Congress, announcing its flagship products here over the last two years. Again, my apologies for the lack of photos. Our photographer is still having connectivity issues, and we're working on getting her back up. And with the GS4 launch, Samsung just missed MWC and unveiled right after in NYC. Roger and I are still trying to block that one out. Okay, we just got the warning message that the show is about to begin. Get ready all! Random aside, there seems to be smoke emanating from the stage. Or it could be a trick of the lighting. The lights are dimmed, the video is playing, here we go. Lots of curvy lines and edges in the video. The whole room is aglow with our florescent wrist bands. The lights are back on, and screens all around us are lit up as a narrator talks about bringing "tomorrow into today." Tomorrow, "metals will flow." Ha! So metal is totally going to be in this phone. 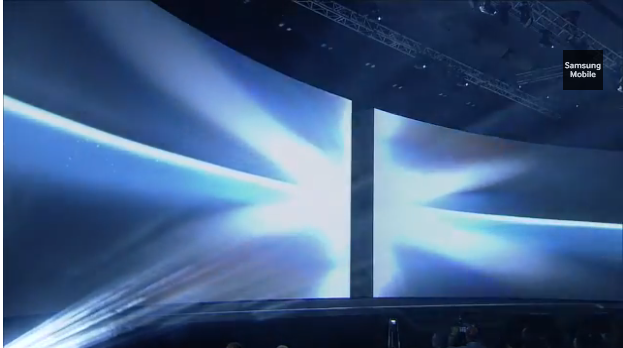 Younghee Lee, the executive vice presient of global marketing, takes the stage. YH Lee is one of the most powerful executives in Samsung Electronics, and one of the rare women in its leadership ranks. This is the most significant team effort in the company's history, she says. And she welcomes CEO JK Shin. He's one of three CEOs, and in charge of the IT and mobile division. Agree: YH Lee is a force within Samsung. No more Internet rumors, he jokes. Today, we unveil what's next, he says.